What exactly is iodine? Iodine is an important mineral with a variety of important roles in the human body. First and foremost, it is absorbed by the thyroid gland and used for the synthesis of two key hormones which strongly influence the rate of metabolic processes as well as the formation and growth of muscle and other tissues. In addition, iodine is required for the normal development of the fetal nervous system during pregnancy, which is why adequate intake of iodine is especially essential for children and pregnant women. In short, adequate consumption of iodine is important for our health, and its lack can lead to morbidity, especially in the context of impaired thyroid function. How big of a problem is iodine deficiency? In one study conducted in Israel by Maccabi Health Services in 2017 with the participation of the Hebrew University of Jerusalem and involving 2,097 children and pregnant women, it was found that there was a shockingly high incidence of iodine deficiency. According to the study, 62% of the children and 85% of the pregnant women suffered from a serious deficiency of iodine. Specifically, urine samples revealed an average of 83 μg/L, while the normal range is 100 to 200 μg/L, meaning the vast majority of study participants were well below the bare minimum. In light of these findings, in December 2017 Israel’s Ministry of Health issued a call to the public to be mindful of their iodine intake, to seek out iodized salt (which is not common in Israel), and to consider supplementation upon consultation with a dietician. How do we get iodine? Like other minerals and vitamins, the human body cannot independently synthesize iodine, and therefore we must obtain it from either food or iodine supplements. The food sources with the highest iodine content include certain fish, dairy products (though not hard cheese), and iodized salt. But the food source with the very highest iodine content is specific forms of algae and seaweed. This is where Seakura’s new seaweed-enhanced product comes in. Seakura is an Israeli company that has developed an advanced formulation containing pure iodine obtained from organically grown Ulva lactuca seaweed (also known as sea lettuce). Every batch of Ulva seaweed is tested for iodine content to ensure that every single capsule of Green Iodine it produces contains the ideal amount of iodine for adults – 150 micromilligrams – and as per the Israeli Ministry of Health's recommendations. 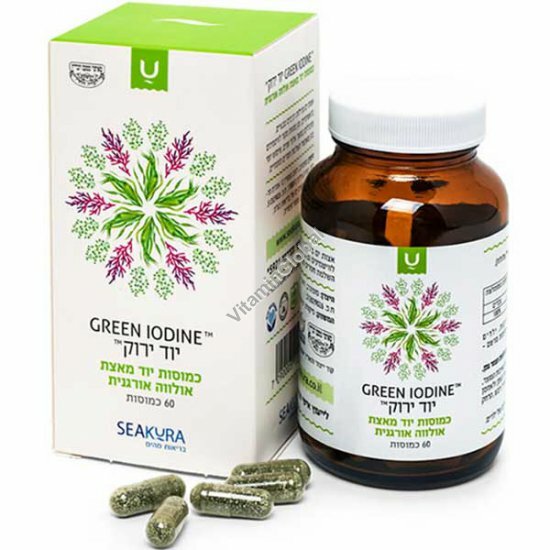 Green Iodine is an innovative and unique nutritional supplement that represents the very best way to ensure that you and your children are getting sufficient iodine. Ingredients: Ulva seaweed. Capsule: hydroxypropyl methylcellulose; cellulose & magnesium stearate (as stabilizers). Adults: 1 capsule (whole or poured into a drink or on food). Nursing mothers: 2 capsules (whole or poured into a drink or on food). *Unused portion can be saved for future use. Kosher under the supervision of the Badatz - Eidah Chareidit Yerushalayim and the Rabbinate of Upper Nazareth. Pregnant women, nursing mothers, people taking prescription drugs and parents considering this product for their children should consult with a doctor before beginning any supplement. This information does not constitute medical advice. In case of a medical problem, contact your physician.